Take advantage of recreational opportunities offered, including a health club, an outdoor pool, and a sauna. Additional amenities at this hotel include complimentary wireless Internet access and shopping on site. 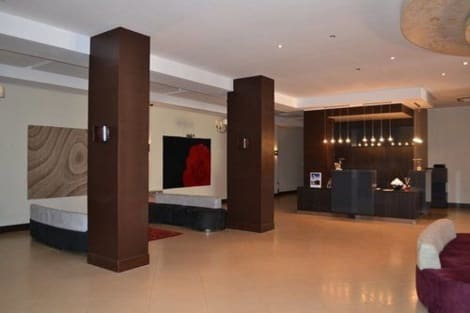 Located just a few kilometres from the Houari Boumediene airport and close to the transport network of the city, this hotel is an ideal base for those travelling on business or for pleasure. Many attractions and places of interest are easily accessible such as Le Jardin d'Essai du Hamma, La Grande Poste d'Algier, the Great Mosque and the Bardo National Museum. For shopping there is the Centre Comercial et de Loisirs Bab Ezzovar and, of course, the famous Kazbah, where the well-known Ketchaoua mosque can also be found. A good selection of restaurants and cafes are within walking distance. The hotel provides many services and facilities, including ones for corporate guests that satisfy their needs and requirements. The accommodation consists of rooms and suites that are pleasantly decorated and furnished with all the essential elements needed to guarantee comfort and enjoyment. Satisfy your appetite at the hotel's coffee shop/café, or stay in and take advantage of the room service (during limited hours). A complimentary continental breakfast is served daily from 6 AM to 11 AM. Stop by the hotel's restaurant for lunch or dinner. Dining is also available at the coffee shop/café, and room service (during limited hours) is provided. A complimentary continental breakfast is served daily from 6:30 AM to 10:30 AM. Satisfy your appetite at the hotel's coffee shop/café, or stay in and take advantage of the room service (during limited hours). A complimentary continental breakfast is served daily from 6:30 AM to 9 AM. lastminute.com has a fantastic range of hotels in Algiers, with everything from cheap hotels to luxurious five star accommodation available. We like to live up to our last minute name so remember you can book any one of our excellent Algiers hotels up until midnight and stay the same night.